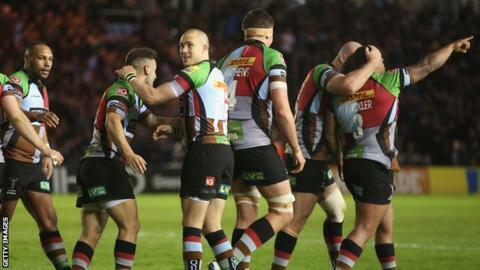 Harlequins kept their Premiership play-off hopes alive with a narrow win over Leicester in a pulsating encounter. The two sides were level at 13-13 at half-time after Vereniki Goneva's opening score for Tigers was cancelled out by a penalty try. A Nick Evans penalty gave Quins the lead but the Tigers hit back with a try from Jamie Gibson, which was converted by Toby Flood for a 20-16 lead. But Mike Brown's late score and a Ben Botica penalty gave Quins victory. Toby Flood put Leicester ahead with a penalty in the first minute and Tigers scored the first try after a flowing team move was rounded off by Goneva as he popped up in midfield. Full-back Mathew Tait seized on a handling error just outside his own 22 and after good work and quick hands from Flood, Ed Slater and Jordan Crane, Fijian winger Goneva accelerated under the posts for his 11th Premiership try of the season, with the TMO deciding the final pass had not been forward. Flood converted for a 10-0 lead after six minutes but Quins fly-half Nick Evans reduced the arrears with a penalty three minutes later. After the two sides had traded penalties the home team forced their way back into the game. Luke Wallace collected Evans' smart grubber kick but was held up over the line by Leicester's England centre Manu Tuilagi. From the subsequent scrum Harlequins were awarded a penalty try by referee Tim Wigglesworth and Evans added the conversion to level the game at 13-13 at the break. After the television match official ruled out a try for Brown in the corner after Blaine Scully just got a hand on the ball first, Quins went ahead for the first time in the match through another penalty from Evans on 57 minutes. Moments later they relinquished their lead as Tigers centre Tuilagi gathered the restart and powered forward before being hauled down. Scrum-half Ben Youngs took a quick tap penalty and Jamie Gibson crossed the line, with Flood adding the extras from out wide. Both teams were then reduced to 14 men as Harlequins second row George Robson and Leicester flanker Pablo Matera clashed and were sent to the bin. Quins regained the lead when Botica, a replacement for Evans, fired a long pass out wide to England full-back Brown, who crossed in the corner to make it 21-20. The home side were given a further boost when Tigers flanker Julian Salvi was sent to the bin for playing the ball on the ground, temporarily reducing the visitors to 13 men. And Botica's late penalty secured the win which lifts Harlequins to within a point of fourth-placed Bath, who host Worcester on Saturday. It ended Leicester's seven-match winning streak in the league but the Tigers picked up a losing bonus point to close to within two points of second-placed Northampton as the champions maintain their push for a home semi-final. "It was a belter of a game that had a bit of everything and more. It's always going to be Titanic between these teams. "I've never heard the Stoop like that, it was absolutely rocking. We dominated the second half. "We created a huge amount, we played with ambition and there was a tempo to our game. "I love seeing us playing like that, it's what we're about. We'll go to Northampton with the bit between our teeth and play. The boys are buzzing and loving their rugby." "What frustrates me is that in three matches this season it has hit double figures in resets before it gets to that point [awarding a penalty try]. "I just want to know how it will be refereed because from one week to the next the rules are different. "I'll ask the question again and will get an answer, but who knows what will happen next. There's no consistency. "If you're inaccurate at the set-piece, you give penalties away and you concede field position, you're going to get punished and we did. "Most of the time you get what you deserve and our inaccuracy and indiscipline killed us." Harlequins: Brown; Lindsay-Hague, Molenaar, Turner-Hall, Smith; Evans, Care; Lambert, Ward, Sinckler; Matthews, Robson; Wallace, Robshaw (capt), Easter. Replacements: Fa'asavalu for Wallace (66),Botica for Evans (68). Not Used: Buchanan, Mayhew, Doran Jones, Guest, Dickson, Chisholm. Leicester Tigers: Tait; Scully, Tuilagi, Allen, Goneva; Flood, B Youngs; Ayerza, Briggs, Mulipola; Slater (capt), Kitchener; Gibson, Salvi, Crane. Replacements: Matera for Crane (20), Williams for Flood (60), Parling for Kitchener (61), Mele for Youngs (73), Morris for Scully (73). Not Used: Hawkins, Stankovich, Balmain. Sin Bin: Matera (63), Salvi (72).